"This is not a TRS party programme, it is being done for the benefit of the next generation and to improve green cover in the State," he said. 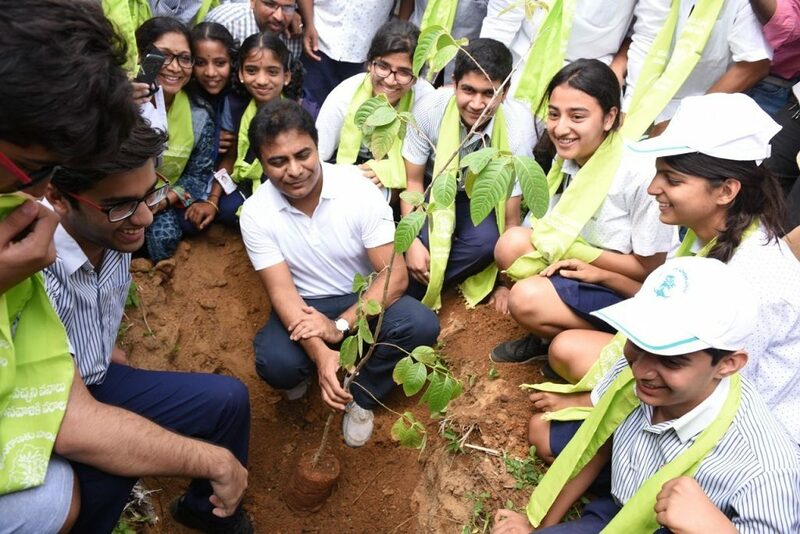 Hyderabad: Municipal Administration and Urban Development Minister KT Rama Rao said the State government’s top priority is to increase the green cover in the city even while taking up different development works. At a few places, flyovers and underpasses are being constructed and a few trees are being relocated. Adopting scientific methodologies, officials have already translocated a few trees from Kukatpally to take up flyover works. Addressing the gathering at the Birds Park here after planting saplings as part of the Haritha Haram programme on Wednesday, the Minister said the Forest department had done a good job in transforming the park, which was once a dumpyard, into a green lung space. Stressing on the need to increase green cover in the State, Rao said the Telangana government was planting 47 crore saplings this year, compared to the 50 crore saplings being planted by 28 States in the country. Emphasis was being laid on survival of the saplings as well. He complimented the Forest department for coming up with seed ball technology, which comprises of soil nutrients and helps in taking up mass plantations in jungles and open spaces. Taking a dig at the Opposition parties for trying to malign the novel exercise of Haritha Haram, he urged politicians to cut across party lines and participate in the programme. “This is not a TRS party programme, it is being done for the benefit of the next generation and to improve green cover in the State,” he said. Home Minister N.Narasimha Reddy appealed to the people to participate in the programme in large numbers and plant as many saplings as possible. Trees provide shade, help in getting more rains and reduce pollution. The government was supplying fruit bearing saplings for households, he said. Telangana State Forest Development Corporation Limited Managing director Chandan Mitra said a 3km cycling track was being developed in the Bird Park for cycling enthusiasts.